"TRP... often has an airy chamber feel though cellist Laurie Haines Reese adds more grit when she fills in the bass lines." "TRP is a special group, offering well-played, joyous jazz that refreshingly and intelligently taps into several other musical genres. Three hearty cheers for their 'Evening in Vermont' album." And this album continues their contribution of unique packages for jazz-wise listeners. Laurie Reese, who plays unbelievable bass lines on her cello, is the prime mover on Bob Dorough’s Comin’ Home Baby taken at a deliberate pace. She also provides the underpinning for Elephant Walk which features fine piano by Kirk Reese with cascading solos. They deliver Be Thou My Vision in a slow churchy mode that Tom explores as the rest of the group murmurs and punctuates behind him. Kirk also shines and Ferracone drums with feeling and restraint. They perform three Herbie Mann tunes, well suited for a flute driven ensemble. Toot Stick is up-tempo led by Tom over his riffing bandmates; Push Push Pull softly rocks with Laurie, Tom and Kirk all prominent; and Memphis Underground cooks with Laurie’s bold cadence, Tom’s soaring flute and Kirk’s driving piano. Battle Hymn is flute and cello in dramatic harmony as the group milks this Yankee Army song to the ninth degree. Not your usual jazz fare. Skylark is just beautiful – Laurie’s cello, Tom’s flute and Kirk’s piano are mesmerizing throughout as they play this wonderful Carmichael title. Skylark is usually a vocal and Laurie’s cello certainly captures the yearning expressed by Johnny Mercer who provided the lyrics for this 1941 song. Mercer commented that he struggled a year after he got the music from Carmichael before he could got the lyrics right. The longing in the lyrics is supposedly Mercer’s anguish over a recently ended affair with Judy Garland. Anita O’Day with the Gene Krupa Orchestera made the first recording of Skylark in November 1941. Dave Butler is the owner, producer and host of the InnerVisions syndicated radio show and former programmer for Jazz So True. Anytime I get a CD from The Reese Project, I expect good solid Jazz and maybe something a little extra. Comin’ Home Baby, is no exception. From the first track to the last I was entertained to the max. The title track, Comin’ Home Baby, is upbeat toe tapping jazz with a little ’60s rock feel. Baby Elephant Walk is as it should be, a sweet trip down memory lane Reese style. Harlem Nocturne really stands out as a Bluesy reminder of The group’s first release, Blue Etude (which, when I heard it for the first time, “Blew Me Away!”). The Celtic number, Be Thou My Vision, was a change of pace I hadn’t expected, but as I listened, I was entranced. There are two Herbie Mann selections. Toot Stick picks up the tempo, and Push Push Pull literally pulls you right back into a no-nonsense track of real Jazz with a capitol “J”. The Battle Hymn is another one of those Reese Project surprises that started out as a Civil War memorial and slipped right into an improvisational masterpiece. Memphis Underground was another great follow up, getting the mood set for the final track, the Hoagy Carmichael favorite, Skylark, a beautiful end to a tremendous undertaking. Kudos to Tom, Laurie, Kirk & Glenn for a truly classic Reese Project! Tom as always stood out with unparalleled improvisationsal imagination on every track. I was happy to see Laurie really make herself known, running baselines with her acoustic and electric cello, and adding electro-rock sounds and standing out overall. Kirk was without a doubt at his finest with nimble fingers on piano (which reminded me of a young Dave Baker) especially noticeable on Push Push Pull, and the array of sounds on the synth that really enhanced Toot Stick. What can I say about Frank, who is clearly a master of percussion. His timing was flawless and the Tympanic drum on Be Thou My Vision was a true master stroke, that brought chills to my arms and a lump in my throat, like I was there in the green. In 2000, I received The Reese Project’s first album, Blue Etude, and I loved the sound. I called Tom, and he asked me, what genre their music fit in. I told him they had a new genre, BlueJazz. I haven’t changed my mind. The Reese Project is one of a kind in their choice of music and their interpretation. They have a great blend and their cohesion continues track after track, album after album, with each one better than the last. The individual talent among the members is evident in whatever musical endeavor or incarnation they may undertake, but their combined knowledge, experience, imagination and improvisational skills without question, sets them well above other jazz acts performing today. Once you hear this album you’ll want to listen to it again and again. After 20 years on the radio, and with nine albums under their own name, The Reese Project has come up with what should be their breakthrough recording: “Cominʼ Home Baby”. 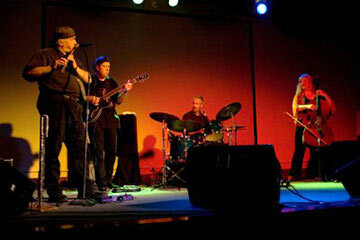 Flutist/bandleader Tom Reese, his brother Kirk on keyboards, Tomʼs wife, Laurie, the cellist who plays bass lines, and longtime collaborator drummer/producer Glenn Ferracone, borrow the steel spine from the Reeseʼs great CD “Blue Etude” from 2000 to reach a rare cathartic emotional truth with these nine tunes. “Cominʼ Home Baby” has the clarity, intensified grace, and compressed energy of a true musical masterwork. It is music for a general audience but, as always with the Reeses, it mainlines the jazz aesthetic and adds improvisational energy to keep the music from sounding lazy. Cominʼ Home Baby, the CDʼs first tune, is an intriguing and welcoming tune by a Pennsylvania composer, Bob Dorough. Baby Elephant Walk skewers its famous circus start into an interesting blues. Harlem Nocturne, the third song, tumbles forward easily, a minor tour de force for the lyrically charged playing of the brothers. To his credit, Glenn Ferracone, the studio tech, keeps his drumming down in the sound mix, letting the rest of the band step up. Be Thou My Vision lends the proceedings a serene, longish pause, which leads to the funky fun of Tootstick and then Push Push Pull, a bruising duck waddle groove piece that gets fully airborne with Tom Reeseʼs operatically intense flute playing. Battle Hymn, with its famous melody recitation, takes off into an inspired but brief space odyssey. It is a fine prelude to the recordingʼs epicenter, a magnificent remake of Herbie Mannʼs '70s pop instrumental hit, Memphis Underground. The Reeseʼs version of Underground is a vertigo inducing potential hit single in its own right. It is probably the best song recorded in the Reese Projectʼs genre. But “Cominʼ Home Baby” might not be so intense without its very fine cello driven end piece, Skylark. Take note: this is “the” Reese Project project!